What are some glassware serving pieces that you might run across? When shopping at your favorite flea market, antique mall or thrift store, it will not take long for you to run across a serving piece. They come in all shapes like platters, punch bowls or even a cup. Not only that, there are a wide variety of materials that they are made of. Berry set—this consists of a large bowl with matching smaller bowls. They are used for serving items like fruit and some desserts. Salt, saltcellar—this is a small bowl used at the table to hold salt. This type of container is also called a “master salt”. Celery vase—this is a tall and narrow vase that is used on the table to hold celery. Compote—this is a dish that usually comes with a stem and a base that is used for serving compote (a fruit that is cooked in syrup). There is a smaller dish that has a similar form used for a serving for one person. This is only a small handful of what you will run across. What types of serving pieces have you run across? There is such a thing as a Malt Nutrine serving tray? Advertising is a fun area to collect—you never know what kinds of pieces you will run across. You might find a piggy bank advertising a local bank, a ruler advertising a grocery store or even a baseball program advertising Spalding baseballs. 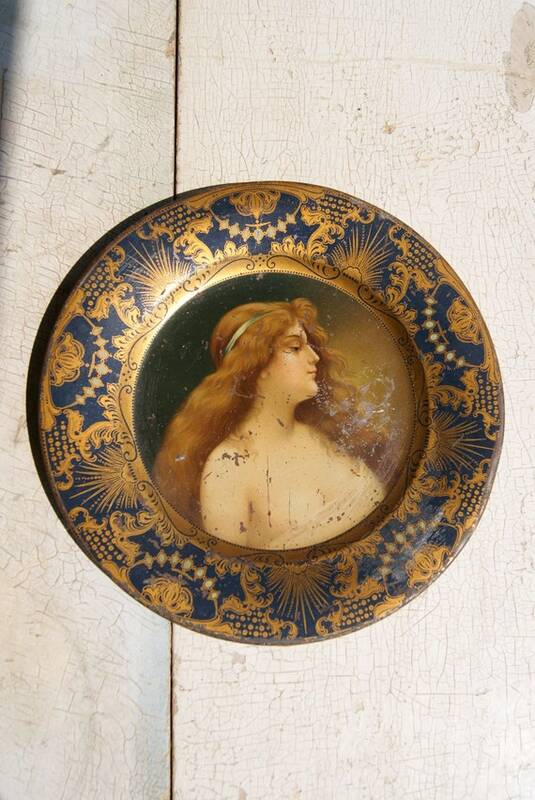 Another area that advertising collectors buy are serving trays. There are quite a few advertisements that you will find on a tray—they range anywhere from Coca Cola to Budweiser. Did you know that Anheuser Bush made a serving tray for a product they made that was called Malt Nutrine? Malt Nutrine was made by Anheuser Bush in 1905, and it was a non-alcoholic beverage. Not only that, it was thought that Malt Nutrine could help cure insomnia. This would be a killer piece to display with fountain drink collectibles. You can see this terrific serving tray in my Etsy shop here. Head on over and check it out! Wow, look at all the different varieties of paperweights! Paperweights are always a fun way to decorate with. Not only that, there are a wide variety of colors and materials that they are made of. It could be glass, resin or even metal in pink, blue or a rainbow of colors. To top it off, there are as many companies and artists that have made a paperweight over the years. One such paperweight is this terrific figural pig variety. The terrific piece of pink with a crystal overlay glassware could also be considered a piece of art glass. You can see this paperweight in my Etsy shop here. Another fun item that you can use as a paperweight is this gnome that is by Tom Clark. The paperweight is dated 1985 and is also titled CHICK. What I like is that Tom Clark includes a penny somewhere on every one of his gnome designs–I love trying to see where they end up (this one has the penny on the left side near the bottom). You can see this terrific paperweight in my Etsy shop here. One of the different companies that has made a paperweight is Fenton. The Fenton glass company has made quite a few of them, and one of the designs that they made is a duck like this one. This duck was made in the 1970’s, and it also has a hand painted face and floral scene on the back. You can see this great item in my Etsy shop here. As a matter of fact, you can see all the different varieties of paperweights in my Etsy shop here. Head on over and check them out! You don’t see this type of teapot every day! You don’t see this type of teapot every day! This teapot is made of pottery and has a Raku style to it, and the piece has a brown glaze with an iridescent sheen. The Raku style that is on this teapot is a process that heats the pottery quickly to high temperatures and then it is cooled quickly. This form of firing will get you a great finish like this on a piece of pottery. The teapot also has no lid no it—I don’t think a lid was made for this piece. Not only that, it also was made by hand with an oversized handle and spout on it. You can say that this piece has a Picasso style to it! You can see this great teapot in my Etsy shop here. Head on over and check it out!